By the beginning of the 21st century, the Iron Age had run its course. There were a number of initial attempts made to create a new continuity in which to house Superman's newly revitalized personality and characterization. The first of these never made it out of the gate: The Superman 2000 proposal would have worked within the established 1986 reboot continuity, but it was ultimately rejected by DC. The 2nd, which retconned the 1986 reboot into "a false memory," also worked within the established continuity but simultaneously incorporated many elements and sensibilities of the Bronze Age. It was floated as a trial-balloon but after much speculation and debate on the part of the fans, DC eventually back-pedalled on it. With the departure of Jenette Kahn from her twenty year tenure as President and Publisher at DC, new paths were examined. 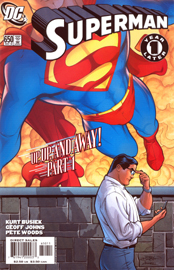 Paul Levitz was promoted to President and DC soon published Superman: Birthright, which created a newly updated origin and continuity for Superman. The book was a critical success and was incorporated into the published comics for a brief time. But it, too, was ultimately decided against by DC. Many writers and artists were experimenting with different ideas - but none of these ideas, for whatever reason, was able to take hold. Dan DiDio came on board as Executive Editor and brought with him new editors, new writers, new artists - and a new approach. Adventures of Superman and Superman were merged back into one title, as it had been prior to 1986 - a very clear signal that DC was serious about change. DC invited Kurt Busiek and Geoff Johns to take on the writing duties. They both said yes, and Superman: the Movie director Richard Donner also agreed to help out. 20 years after the publication of Superman #423, Superman and The Adventures of Superman are re-merged back into one title with Superman #650.